Do your fingers ever start to go numb just from looking at the amazingly intricate work that some steady-handed artist had the time and dexterity to complete? 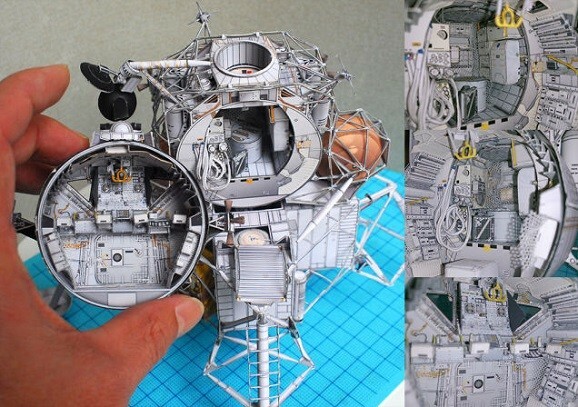 I had to finish typing that sentence with my nose because these papercraft models are almost too amazing to be real. 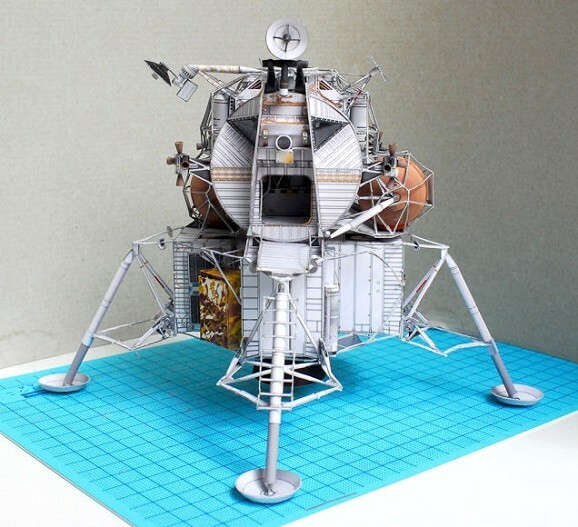 To kick it off, check out the lunar module from Apollo 13. It already looks amazing, right? Good enough that you’d want to touch it (or throw water on it, if you’re a douche) to make sure it’s all legit. But yes, it definitely is, and what’s more, the Japanese artist who put these together didn’t just do the outside of the ships. That would be total weak sauce. This person actually creates everything that goes inside the ships as well. It’s like building a dollhouse and then creating your own tiny cobwebs in the basement. Maybe it’s not like that at all and I”m just too blown away to pay attention to what I’m saying. Here’s a shot that’ll give you some insight into the lander’s scale, and just how intricate the work is inside the vessel itself. You better put a pillow under your jaw. Egad. Some of those details look like they’re no thicker than a fingernail, and all of it looks far more clean and in order than my fingernails. I wonder how much it all weighs, and if it’s all just pieced together without being secured. While I’m busy asking questions to the blank space in front of me, check out another one of my favorites, the Space Station V from 2001. I dare not start to question if there’s a little man running around inside. 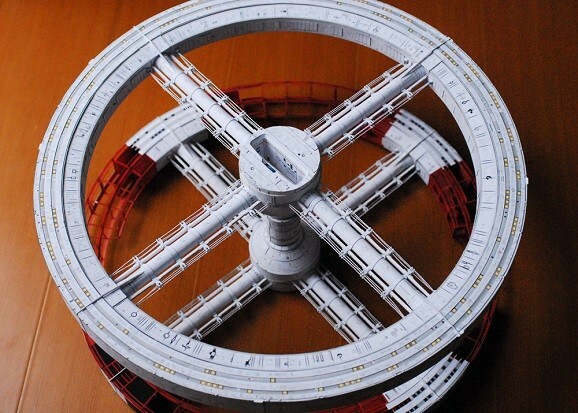 While the list of completed projects isn’t quite exhaustive, there are still quite a selection, including Interstellar‘s Endurance, the Viper Mk2 from Battlestar Galactica, Barbarella’s ship, and more. And it’s not just ships, either. There’s also this bad boy to go with some character busts and…Chitty Chitty Bang Bang. 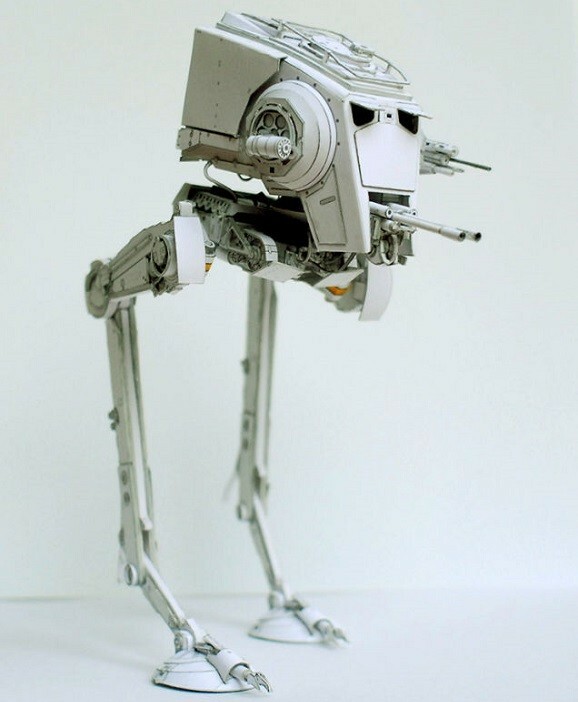 But we know you just want to see the AT-ST. Check out the rest of the work here, and try not to get carpal tunnel while looking through them. All of the designs for the models are included and are free to download so you can do this yourself at home. It’s like Christmas, if you had to make your own gifts. Did that analogy fit any better? Seriously, I wish I had the patience to do anything even remotely that cool.